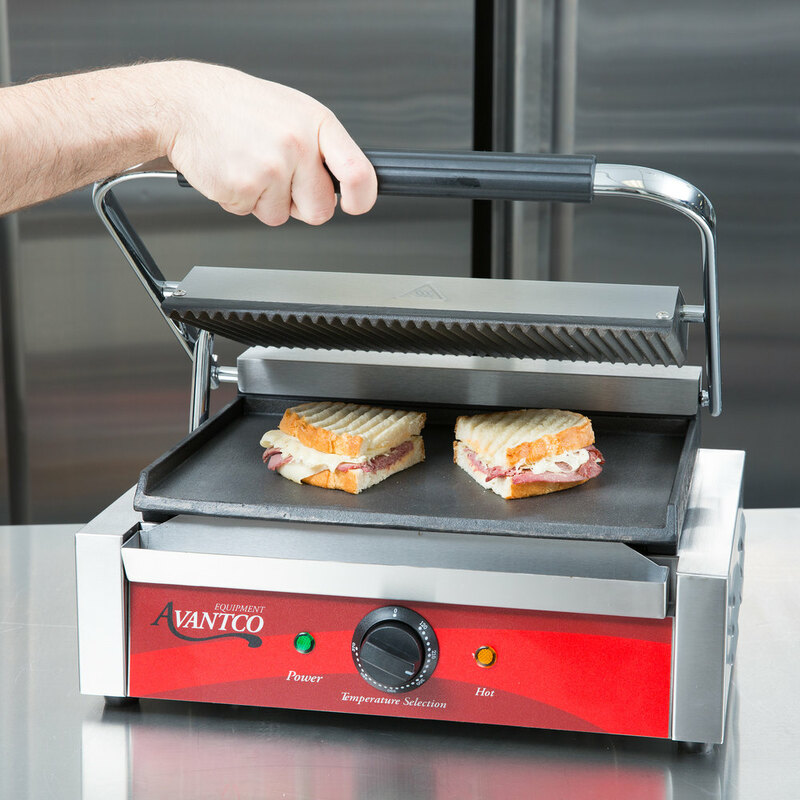 Create your most popular sandwiches, quesadillas, hamburgers, and more with the Avantco P75SG grooved top and smooth bottom commercial panini sandwich grill! 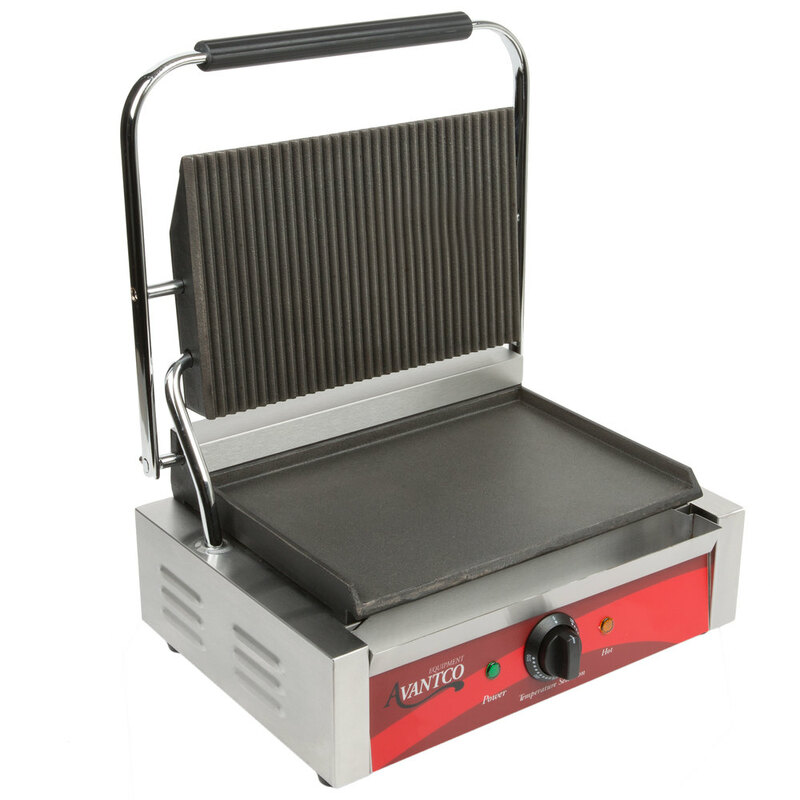 This sandwich grill features 1750 watts of heating power for fast and thorough cooking. 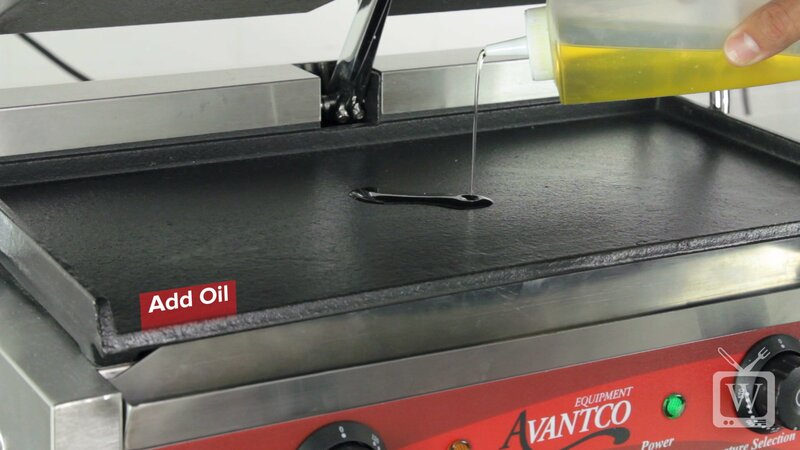 Its grooved top provides tantalizing grill marks for an excellent presentation, and the smooth bottom plate ensures complete contact with your product and consistent, even heat supply. 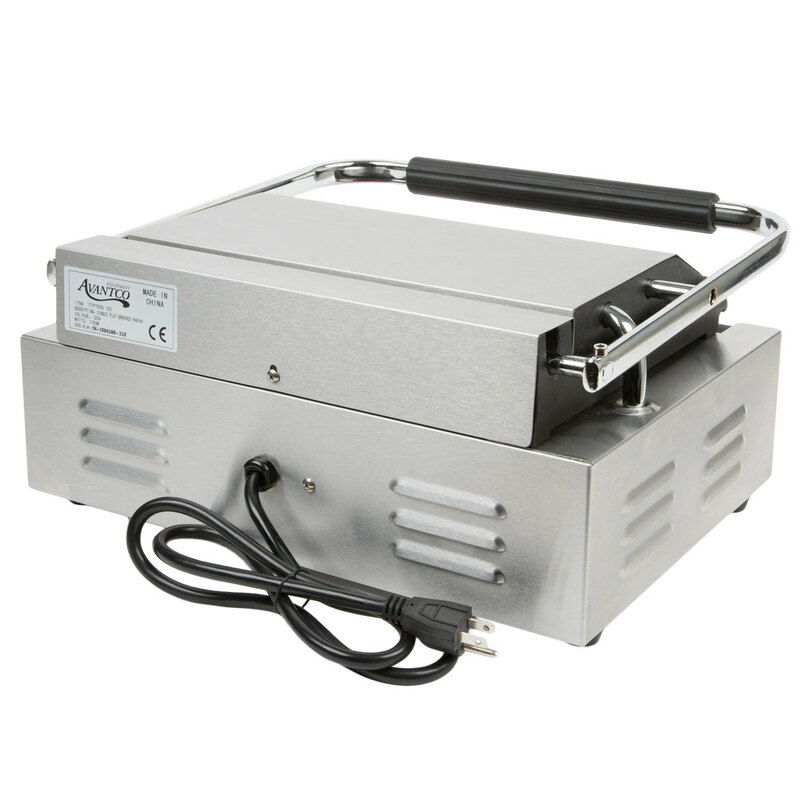 The temperature is easily adjustable between 120 and 570 degrees Fahrenheit to cook or warm a wide variety of foods, while the stainless steel exterior and cast iron plates ensure long-lasting durability and strength. And thanks to the included drip tray, cleaning up is a breeze after every use. Instructional vid was short and simple. Sold 25 paninis at my event, they were a crowd hit. Will use this at every event from now on! We love this grill. Initially it was ordered by mistake, but we quickly put it to good use frying bacon and eggs! It cleans up well and works great. No panini is complete without delicious cheese, which is why our paninis are the best of the best! You can't make great paninis without a trustworthy panini grill, so that's why we chose this as our grilling companion. We purchased this Sandwich Grill a while ago and it has performed very nicely ever since. It was a very good price as as many of the appliances we have purchased from The Webstaurant store are. It has held up very well and we will probably be purchasing another soon. We just love this press, it's so mutli practical. The temperature control is what makes this such an amazing piece of equipment, we can press sammie or make toast with it. This commercial panini grill in my new star in my kitchen! I love the groove on the top and smooth bottom. I highly recommend and it's worth investing! This machine is great. We dont specialize in panini so we have this idling at 200 degrees, when we get an order in we turn it up to 350 degrees. gets there in about 3 minutes. High volumes are a problem when you go 10 in a row or more because of lack of heat retention and/or power. But if youre selling that many sandwiches you should go more heavy duty anyway. Like i said, great little machine that gets the job done. 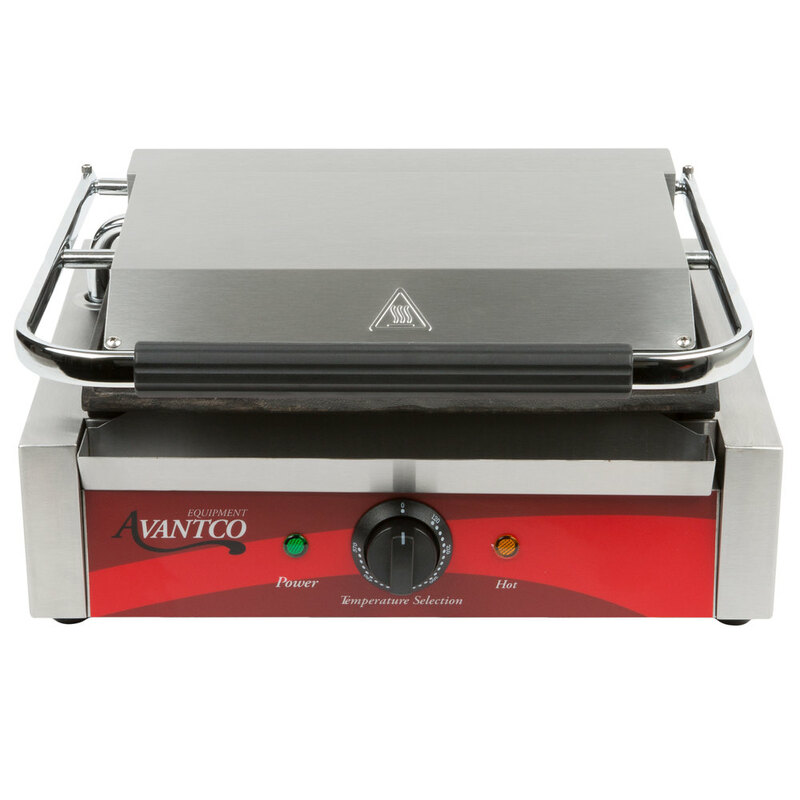 The Avantco P75SG Grooved Top and Smooth Bottom Commercial Panini Sandwich Grill - 120V, 1750W is very quick and makes great grilled sandwiches. I definitely recommend this unit. We bought two of these for our pub and we use them hard. So far they are holding up great and make really nice paninis. We are getting another one with smooth top and bottom for another type of sandwich. I have been looking at Panini Grills for awhile and am so glad I selected this one. It heats up very quickly and is so easy to use with the awesome cast irons grids. 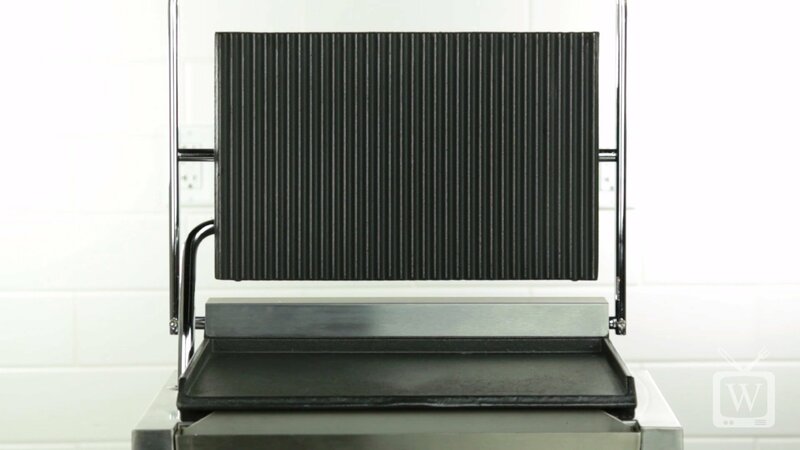 This can be used for Panini's, grilling vegetables, chicken breast and clean up is a breeze. Very high quality. This sandwich grill is just what we needed to simplify the process. It doesn't take up too much space and works just as indicated. The helpful product videos show you just how to clean and season the iron plates. Clean up is easier now. 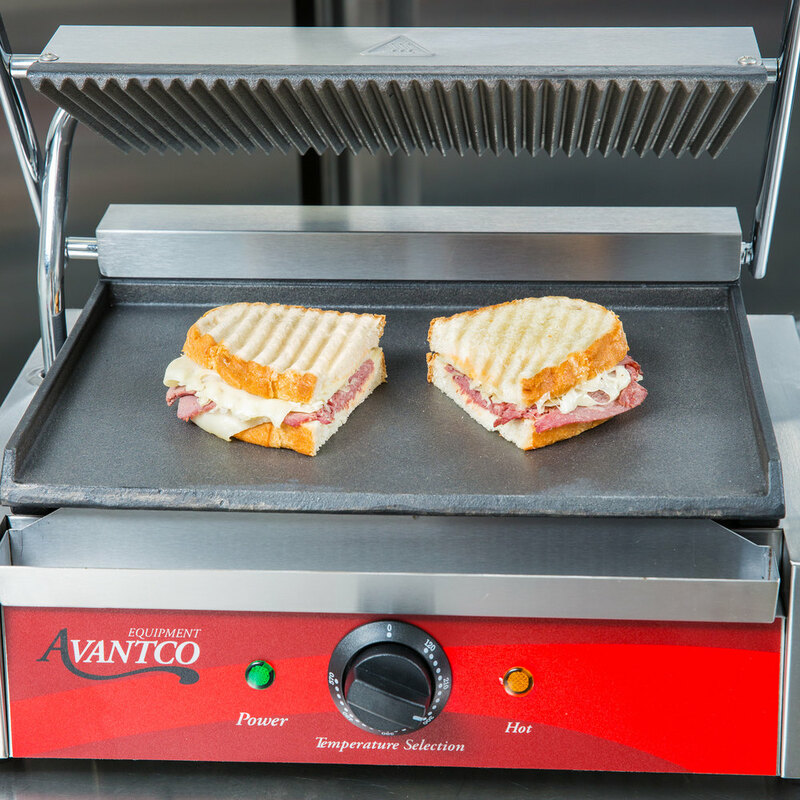 We have used this panini grill for a few weeks now and LOVE IT! The grooved top and smooth bottom makes for easy cleaning. It will fit several sandwiches on at one time.